My name is Kris Lord. I am The Lawn Man. 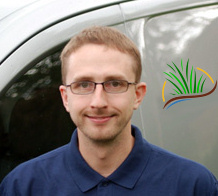 In 2010, after ten years building my own IT business, I boldly ventured into the lawn care industry. I needed a career change which involved being outdoors and working face to face with customers. Back then, owning a lawn care franchise ticked all the right boxes and seemed like a great way to get into the industry. Over the following 8 years I learnt the trade and built a successful lawn care business in South Manchester. However, always being restricted by the Franchise I looked to move. In early 2018 an opportunity arose for my family to move to the beautiful county of Devon. So I left the franchise and moved my lawn care expertise to sunnier climes in the South of England. The Lawn Man is completely independent. The knowledge gained through 8 years of lawn franchising is a valuable asset and I am able to provide an excellent lawn service, with the best products and service for you. The area I cover runs is around the Exeter area of Devon. Including Dawlish, Crediton, Cranbrook, Exmouth and Budleigh Salterton. I pride myself on providing my customers with a friendly, professional lawn care service and effectively treating all sorts of lawn problems. My services cover treating fungal diseases like Red Thread and Fusarium through to providing additional beneficial lawn treatments such as biostimulants and mechanical treatments. If you live in the Exeter area, please don’t hesitate to get in touch and I would be happy to pop round and take a look at your lawn. If you live outside of my coverage area, send me a question and I’ll be happy to answer it on this site for you. Please be patient though, as I do get a lot of questions!